Taliban warfighters aren't the only threat to American forces in Afghanistan. There are also the nastly explosives they leave behind. But rather than simply reinforce some Humvees and hope for the best, General Atomics has developed a system to spot IEDs from the air, up to a mile away, day or night. This high-altitude Intelligence, Surveillance, and Reconnaissance (ISR) system utilizes a suite of ultra-high resolution sensors and night imaging devices mounted on the belly of a reconnasaince aircraft. Filming from above, these sensors identify IEDs and other hazards embedded along roads and trails. General Atomics has been working on its Highlighter system since 2005, and that has been employed throughout Operation Iraqi Freedom. This 1600-pound airborne electro-optical sensor package, integrated into a C-12 aircraft, is designed to not only search for immediate threats like implanted IEDs, but also produce high-quality terrain maps that can provide essential intel for upcoming missions. During sweeps, the Highlighter system generates wide-area images in both color and monochrome using its WFOV cameras. 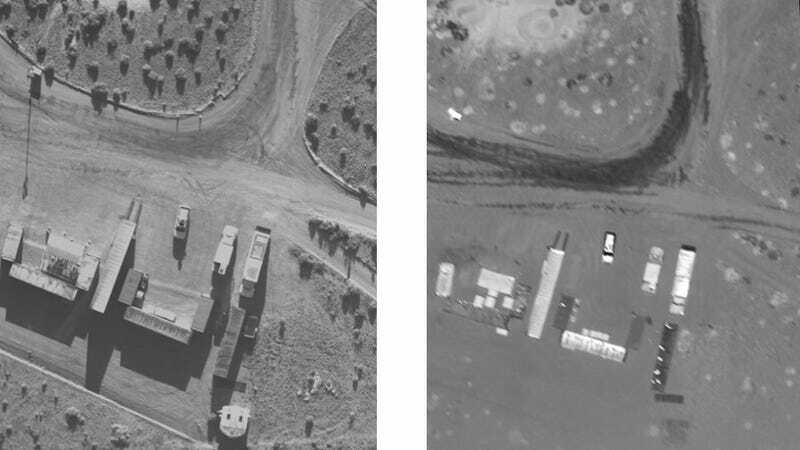 On-board image processing software automatically scans these images for potential mined threats and, if it gets a hit, a trained imagery analyst (also on-board) will verify the threat and disseminate that information to nearby ground troops over encrypted UHF/VHF voice and data lines. The only limitation was that the Highlighter system was most effective at spotting explosive threats during daylight hours. The system was essentially useless whenever the sun set. So General Atomics created the new Nightlighter system by augmenting Highlighter with high-resolution night vision sensors. "Identifying and defeating IEDs before they detonate is one of today's most pressing ISR [Intelligence, Surveillance, Reconnaissance] challenges," said Dr. Michael Perry, vice president, Reconnaissance Systems Group, GA-ASI. "Nightlighter's ultra high-resolution imagery not only detects IEDs in day or night, but also can be processed rapidly into precision, wide-area, three-dimensional relief maps of terrain and structures that are of high value to both mission planners and the warfighter."